Inclusive green economy is a balanced and realistic pathway to sustainable development. As an economic model, it differs from traditional ones in that it takes due consideration of environmental and social externalities, and does not focus on GDP growth as ultimate economic goal. It rather focuses on resource efficiency and on ecosystems, as a building block of the economy, taking into account that environment degradation undermines long term economic growth and human development. As defined by the European Environment Agency, a green economy can be understood as one in which environmental, economic and social policies and innovations enable society to use resources efficiently -enhancing human well-being in an inclusive manner, while maintaining the natural systems that sustain us. 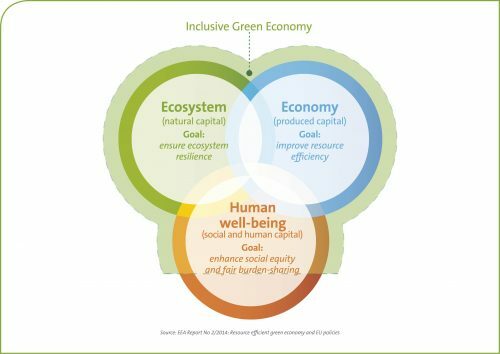 Inclusive green economy is associated to a wealth of opportunities, for both people -to improve their living environments and have decent jobs- and for businesses – to increase benefits through more efficient production practices that generate savings, take advantage of the growing market for environmental goods and services, improve their image etc. The transition to an inclusive green economy entails joined efforts at many levels, including in stimulating sustainable lifestyles, scaling up sustainable consumption and production (SCP) and encouraging green entrepreneurship, through the advancement of eco-innovations, the facilitation of resource efficiency, and the mainstreaming of green consumer behaviour. In the course of change, new green jobs are to be created without compromising on existing employment, and a significant reduction on carbon emissions, waste and other forms of pollution is to be achieved.